Guest post by Jonathan Kane. Mr. Kane describes himself as an “armchair paleontologist” who worked as an intern at the New Jersey State Museum under natural-history curator David C. Parris from 2001 to 2005. He is the lead author of God’s Word or Human Reason? An Inside Perspective on Creationism , coauthored by Emily Willoughby and T. Michael Keesey, shortly to be published by Inkwater Press. Modern young-Earth creationists almost universally accept that speciation is possible. 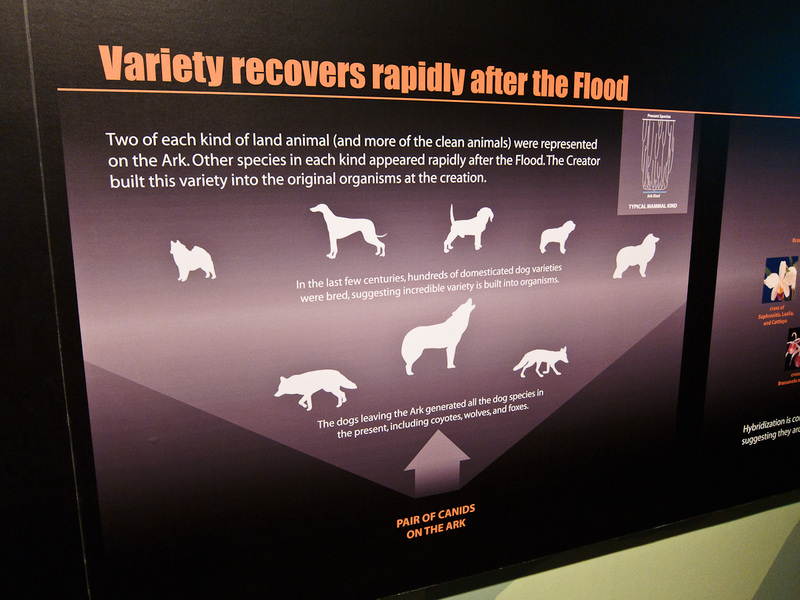 This image from the Creation Museum shows how, from the creationist perspective, all dogs, wolves, foxes, and coyotes share a common ancestor and are descended from a single pair of canids that were on Noah’s Ark. In contrast to the “tree of life” referred to by supporters of common descent, creationists sometimes refer to the “orchard of life,” made up of many separate trees. 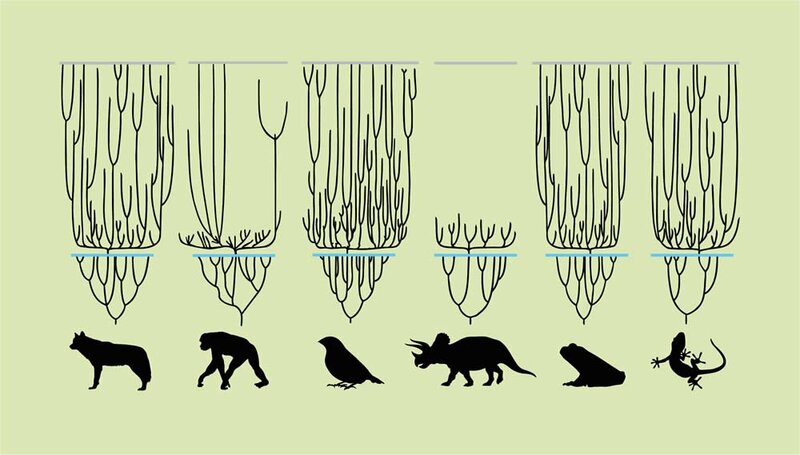 Each of these trees represents a group of interrelated species, which is unrelated to other such groups, as shown in this chart used by Ken Ham during his debate with Bill Nye. One of the tenets of this view is that while species within a baramin may be related to one another, they cannot be related to any species outside the baramin. Therefore, in any case where a species combines anatomical traits from multiple baramins, the creationist perspective requires it to be placed firmly in one baramin or the other. Placing it often is no easy task. This article from Talk.Origins summarizes how creationists have attempted to classify several fossils of hominids that have a combination of ape-like and human-like anatomy, based on the requirement that every fossil must be classified as either fully human or fully ape. Opinions have ranged from classifying them all as apes (Jack Cuozzo) to classifying them all as humans (Peter Line), with many other viewpoints in between. How then are dinosaurs and birds classified? Like apes and humans, creationists almost universally consider coelurosaurian theropods and birds to be separate baramins. Unlike in the case of apes and humans, though, they have generally not attempted to come up with complete classification systems to identify the division between birdlike dinosaurs and birds. (There are a few important exceptions, which I’ll discuss later on, where creationists have attempted to identify the division.) However, Answers in Genesis has done the next best thing. Whenever a new specimen of birdlike dinosaur is discovered, they have typically published an article explaining which way they classify it. The following is a not-quite-complete list of birdlike theropods that Answers in Genesis has classified as dinosaurs, with links to the articles explaining their classification in each case: Sinosauropteryx, Beipiaosaurus, Oviraptor, Troodon, Velociraptor, Sinornithosaurus, and Ornithomimus. And those that they have classified as birds: Caudipteryx and Protarchaeopteryx, Eosinopteryx, Zhenyuanlong, Microraptor and Anchiornis, Changyuraptor, and Epidexipteryx (see below). As far as I can tell, Answers in Genesis hasn’t attempted to classify Shuvuuia, Similicaudipteryx, Ningyuansaurus, Jinfengopteryx, or Yi. Based on their classification of Caudipteryx and Eosinopteryx, I think they would most likely consider Similicaudipteryx and Jinfengopteryx to be birds, but it’s anyone’s guess what they would decide about Yi. 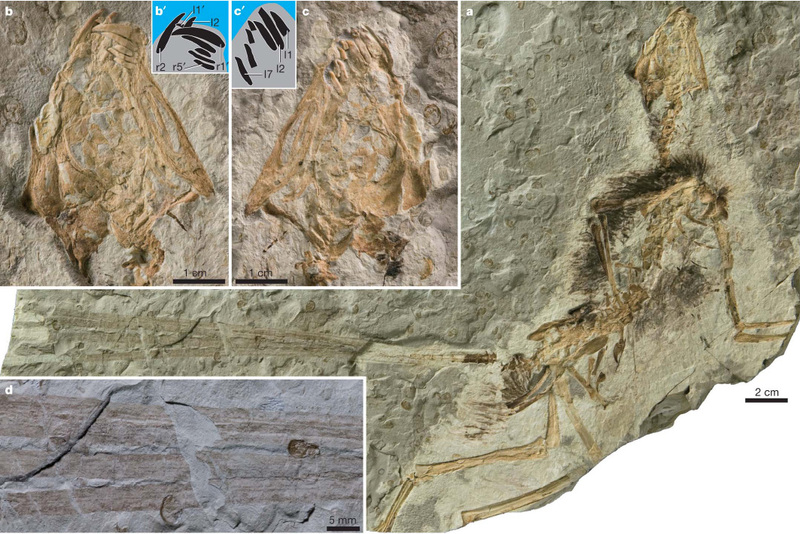 One especially interesting case is Xiaotingia, because Answers in Genesis discusses it in several articles (here, here, here, and here), but in no case do they directly state whether they consider it a bird or a dinosaur. 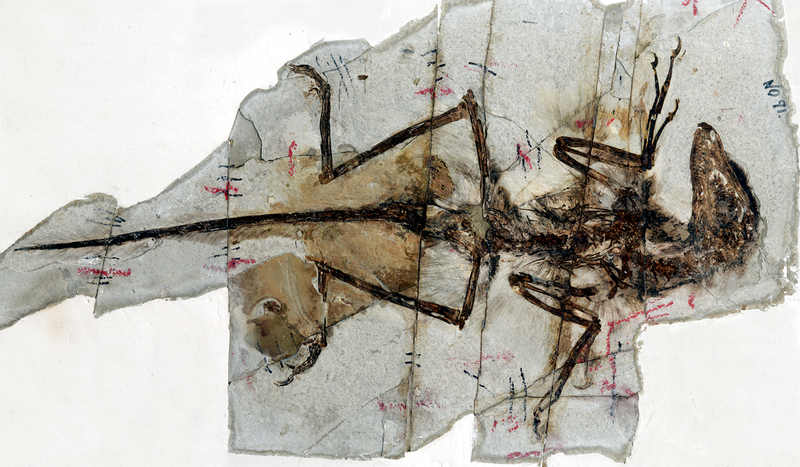 The last linked article argues that Xiaotingia has “no definitive plumage,” which implies that they consider it a dinosaur rather than a bird. On the other hand, AIG’s sister organization Creation Ministries International implies the exact opposite, emphasizing how similar Xiaotingia is to Archaeopteryx. They state, “I lean toward the idea” that many feathered dinosaurs are in fact extinct birds [emphasis in original], although they do not specifically say whether they consider Xiaotingia an example of that. Answers in Genesis and Creation Ministries International might disagree over which way to classify Xiaotingia, but there are other cases where AIG seems to have had trouble making a decision for themselves. When Epidexipteryx was first discovered and described, they stated that it “sounds more like an extinct bird to us than any sort of dinosaur.” But a few years later, they argued instead that it does not actually have feathers: “Epidexipteryx is considered a ‘feathered dinosaur’ because it supposedly has ‘elongated tail feathers’ but no other feathers. 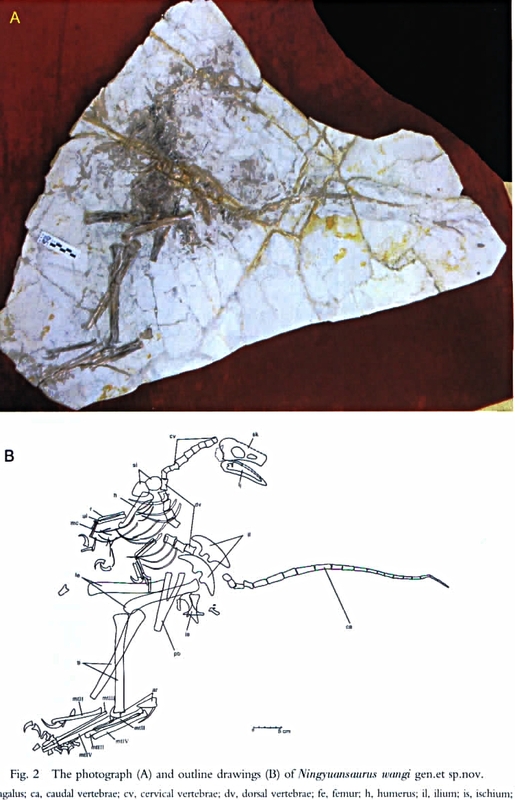 The long straight structures in the photos published with this study, however, do not look like feathers.” As with Xiaotingia, they did not state outright that they now consider Epidexipteryx a dinosaur, but their argument that it did not have feathers certainly implies that they no longer think of it as a bird. The animal Answers in Genesis seems to have had the greatest difficultly classifying is Aurornis. They have only a single article discussing it, in which they say, “We don’t claim, on the basis of the material published so far, to know what kind of animal the Aurornis was.” Their uncertainty how to classify Aurornis presents a puzzle of its own, because according to its description Aurornis is anatomically more birdlike than Anchiornis, and AIG seems certain that Anchiornis is a bird. While their respective opinions about Anchiornis and Aurornis may seem like a contradiction, in fact it is an example of a deeper irregularity in the way creationist organizations classify theropods. If one wanted to draw a sharp line between theropods and birds, the simplest way to do it would be draw the line at the border of a well-defined clade — for example, by saying that all maniraptoran theropods are birds, and that everything else is a dinosaur. But from the lists of animals Answers in Genesis classifies as theropods or as birds, it’s clear that they aren’t drawing the line in such a simple and clear place. They classify at least two dromaeosaurids (Velociraptor and Sinornithosaurus) as dinosaurs, but classify another three (Zhenyuanlong, Microraptor, and Changyuraptor) as birds. 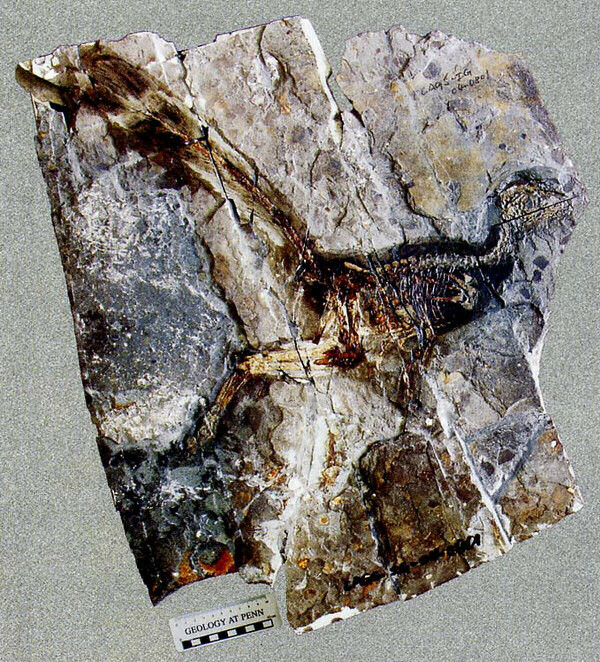 As far as skeletal anatomy is concerned, are there any birdlike traits in Zhenyuanlong that are not also found in Sinornithosaurus? 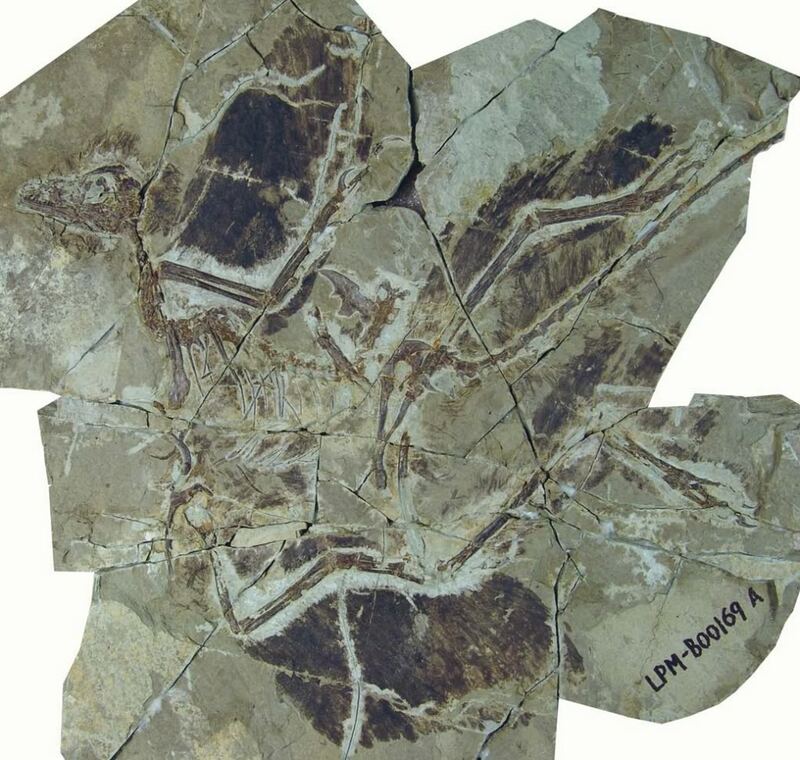 The articulation of the femoral heads in this fossil is so dorsal and posterior–practically at the back wall of its body–that, if Zhenyuanlong had walked crouching on top of its legs like a biped dinosaur, it would have been very unbalanced and fallen on its face. But if the femur were incorporated into the abdominal wall as we see in all birds, and it consequently walked from knee down (on its “drumsticks”), Zhenyuanlong would appear to be balanced. The Zhenyuanlong suni holotype. Image by Junchang Lü and Stephen L. Brusatte. Creative Commons Copyright CC by 4.0. Zhenyuanlong has a femoral head that articulates nearly at the back wall of its body, but so does every other dromaeosaurid whose hip joint is preserved, including those that AIG classifies as dinosaurs. For example, compare the hip articulation on Zhenyuanlong to the hip articulation on the fighting Velociraptor specimen. There’s a very simple reason Zhenyuanlong appears as though it could not have been balanced if it walked the same way as most theropods: in the only known fossil of Zhenyuanlong, the rear half of its tail is missing. (This is pointed out in the fossil’s description.) In most theropods, the weight of the tail counterbalanced the upper body to position the animal’s center of gravity directly over its legs, but that balance can’t exist when a portion of the tail is broken off. The place where it’s broken off is quite easy to see in the photograph above, and it lines up exactly with a crack in the rock slab. There are two groups of dinosaurs: ‘bird-hipped’ or ornithischian (including Stegosaurus, Camptosaurus, and Triceratops), and ‘reptile-hipped’ or saurischian (including T. rex and Brachiosaurus). However, birds are alleged to have evolved from the reptile-hipped dinosaurs, not the bird-hipped ones! Well, Caudipteryx is a saurischian dinosaur, and as Wang et al. point out in this paper, it has a typical saurischian-style pelvis. (The wording in this paper is not easy to understand, but the statement that the pubis of Caudipteryx is oriented “antero-ventrally” means that it points downward and forward. In birds and ornithischian dinosaurs, the pubis points downward and backward.) You can’t have it both ways: if this difference in pelvic structures between saurischian dinosaurs and birds is so significant, as argued by CMI, then according to their own criteria Caudipteryx cannot possibly be classified as a bird. Although AIG and CMI have not said so outright, I suspect that the most important factor in their classification is their need to support the position that there are no dinosaurs with feathers. Based on that position, if an animal has well-preserved feathers they must always classify it as a bird, regardless of how dinosaur-like its skeleton is. If I am correct that this is what their classification is based on, I would be very curious how they classify the Dave specimen of Sinornithosaurus. A 1999 article at both CMI and AIG states that they consider the type specimen of Sinornithosaurus to be a dinosaur, and both organizations have reiterated this view respectively in 2003 and 2010. Based on its well-preserved feathers, would these organizations classify the Dave specimen as a bird, even though it and the type specimen belong to the same species? It could be pointed out that evolutionists also disagree on how fossils should be classified, which species they belong to, etc. True enough. But according to evolutionary thinking, these fossils come from a number of closely related species intermediate between apes and humans. If this is so, we would expect to find that some of them are hard to classify, and we do. Creationists, on the other hand, assert that apes and humans are separated by a wide gap. If this is true, deciding on which side of that gap individual fossils lie should be trivially easy. Clearly, that is not the case. The problem described in Foley’s article has been extensively discussed, including by creationists, for example in this paper. However, creationists do not seem to generally be aware that the same problem exists for many of their attempts to classify birdlike dinosaurs and primitive birds. For paleontologists working within an evolutionary paradigm, it is not surprising that there are animals that straddle the line between dinosaurs and birds, and such animals will always be hard to classify. On the other hand, if there is no biological relation between maniraptoran theropods and birds, why is it so difficult to tell them apart? These contradictions exist not only because of the lack of a clear anatomical boundary between theropods and birds, but also because of the entire approach used by Creation Ministries International and (especially) by Answers in Genesis, which places less importance on internal consistency than on coming up with an argument against evolution that sounds convincing to lay people. Whenever there is a new, widely publicized piece of evidence that some dinosaurs were feathered, Answers in Genesis quickly publishes an article to dissuade their readers from being convinced by it, typically less than a month after the discovery is announced. But since these articles are stopgap measures intended only to address the latest piece of evidence, it is a low priority for them to make these articles consistent with what they or other creationists have argued in the past. But not all creation scientists work this way. It is the nature of creation science that all physical models most conform to one’s interpretation of the Bible, but within these constraints, creation science has a handful of practitioners who make a genuine effort at finding a model that is most consistent with the data. Most of these people are not particularly well-known, but one example of such a person is Steven J. Robinson, for example in this paper. Robinson’s paper is the only time I have ever seen a creationist cite Karl Popper about the importance for physical models to be testable, including creationist models. What happens when this rarer type of creation scientist tries to come up with a classification of theropods that accounts for all of the anatomical data from many different species? Given the clarity of the series, it seems at least reasonable for creationists to consider the possibility that the Jurassic “bird” Archaeopteryx really is related to theropod dinosaurs, not as descendant but instead as their ancestor. Their paper then goes on to describe the four wings of Microraptor, the remains of feathers in Shuvuuia, and the quill knobs on Velociraptor as all demonstrating the existence of feathers in nonavian dinosaurs. Importantly, among creationist technical articles, this study appears to be — at least for now — the final word on the subject. I do not know how to judge whether its results are widely accepted among baraminologists, but as far as I can tell there are no newer creationist studies that have argued against it or superseded it. Though differing from the modern-appearing birds that share their place in the fossil record, some fossilized animals have genuine feathers and other avian anatomical features. Why can’t everyone just call them all extinct birds? Because to do so would rob the evolutionary community of the transitional forms they claim to have. A better answer might have been, “Because they are classified as dinosaurs by the creationist technical literature.” The above quote is from an article published in 2015 — four years after Cavanaugh presented his study at the CBS conference, and two years after Garner et al. presented their study at ICC. Since Answers in Genesis has cited these two studies elsewhere, their argument that all feathered fossils should be classified as birds cannot be attributed to mere ignorance. Nor are they trying to present a counter-argument for why they think Cavanaugh’s and Garner’s conclusions are flawed. In this case, they seem to be banking on the hope that most of their readers will not be familiar with the creationist technical literature, and therefore won’t be aware of how Answers in Genesis is contradicting it. AIG’s justification for rejecting the existence of feathered dinosaurs is an example of a general principle that applies to most areas of creationist argumentation. When there is a concept that is commonly discussed in the context of evolution or an old Earth, even if there is nothing in creationists’ interpretation of the Bible to prohibit their accepting the concept, some of them still can always be counted on to attack it. It usually is only with great reluctance that creationists come to accept such ideas, and even after a majority have done so, there always continue to be many holdouts. The physical reality of the geologic column was accepted by mainstream geology by the 1840s, and a majority of professional young-Earth creationists came around to accepting it approximately 150 years later. It may not happen during my lifetime, but I predict there will eventually be a similar transition with respect to accepting the existence of feathered dinosaurs. The studies by Cavanaugh and Garner et al., classifying unequivocally feathered animals as dinosaurs, represent the earliest stages of such a transition. The most important question is how long it will take for this transition to work its way all the way to Answers in Genesis — and how long it will be before they put feathers on the Utahraptor model at their Creation Museum. Update: In the time since this article was published, Answers in Genesis has removed their 2008 article calling Epidexipteryx an extinct bird, and has replaced it with a redirect to their 2014 article arguing that it does not actually have feathers. The above link to their 2008 article thus no longer works, but their article is archived here. See also my Panda’s Thumb article from October 2018.